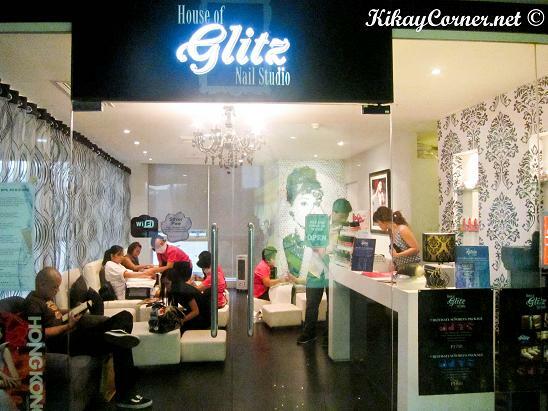 Last weekend was spent with blogger friends at the House of Glitz Nail Studio for some ultimate pampering experience. 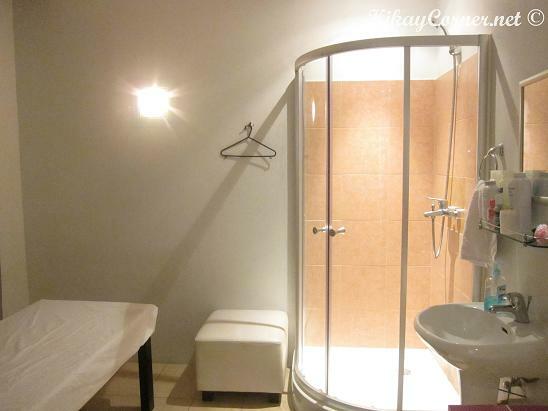 Upon entering the spa comes the ambiance conducive to total relaxation it is built for. As I was handed the menu of services House of Glitz offer, I was torn amongst all that I would love to have done. Since I had an appointment later that day, I just had to give in to two. 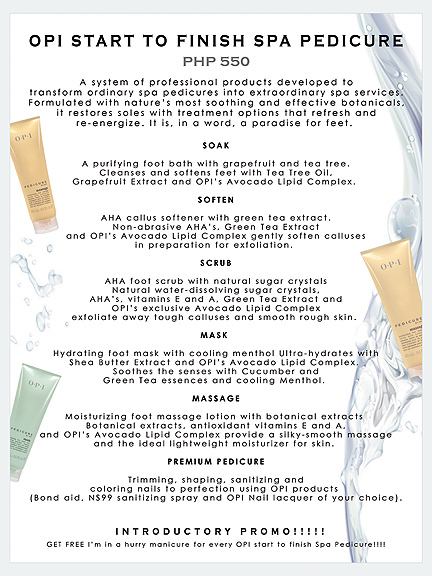 The Opi Start to Finish Spa Pedicure, which is a must have for those who love getting their feet pampered like I do and the Brazilian wax that I was due to have done a week back. First off, the Opi Start to Finish Spa Pedicure. After having tried probably all the feet pampering spas over the metro offer, I thought I was ready for something different and this was it. As the service name would tell, the procedure was done using an all exclusive celebrated brand the world over, OPI. The House of Glitz Nail Studio’s OPI Start to Finish Spa Pedicure transforms an ordinary spa pedicure procedure into an extraordinary spa service. A total paradise for my pretty feet, at least that’s what my husband calls them. 🙂 I came in the spa with a not too glam big toe condition – the dreaded ingrown! 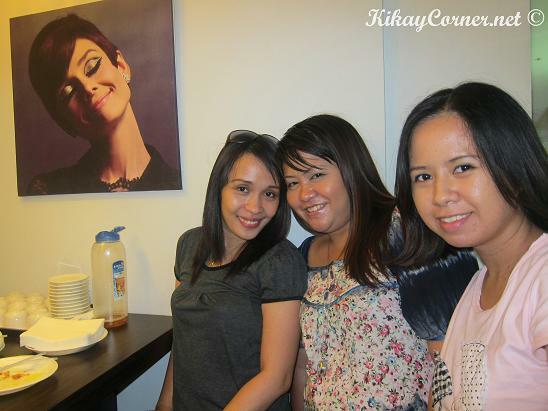 It was not only that that was taken cared of, I felt myself energized and refreshed when it was all done. I don’t know about you, but getting my feet pampered does that to me. What is so sweet about this is they are currently having this on promo for P550. Because of time constraint and an appointment to catch, I was not able to have a manicure spa anymore. I proceeded to have the Brazilian wax done. 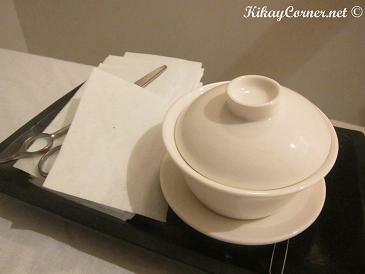 This is the first time I did not go to my usual waxing salon, by the same waxing specialist, if you may. I kind of wanted to just stick to the same lady to do the waxing for me. But because of my skin getting burnt during my last waxing procedure with that former waxing salon I used to go to, I thought I’d give the House of Glitz a shot. I don’t know for sure what happened during that last visit, if the lady used abrasives or something because the burnt skin stayed for a while. 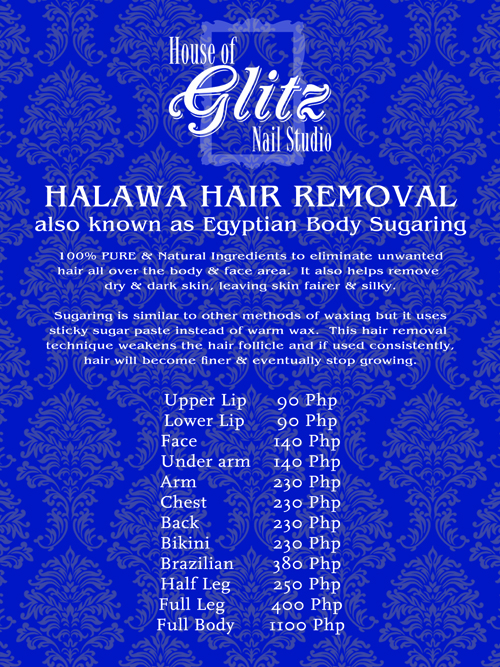 The House of Glitz Nail Studio makes use of the Egyptian Body Sugaring, which is also known as the Halawa hair removal system. They use 100% pure and natural ingredients which also help remove dry and dark skin. 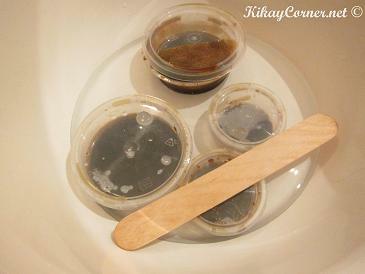 Sugaring is similar to other methods of waxing by the way it is applied to the unwanted hair. The difference is it uses sticky sugar paste instead of warm wax. Should you decide to come and try their waxing services, allow your hair to be at least 1/4 cm long before the treatment. On average, a person should get an underarm waxing every 3 weeks, half leg wax every 3-4 weeks and Brazilian every 6 weeks. After treatment it is highly recommended that you wait at least 5 hours before you wash the waxed area.